Listed in: Benchers, Books, Candlesticks, Ketubah, Kittel, Silver, Tallis and Yarmulkes categories. Whether you are looking for a gift for someone special, or just looking for the latest in Jewish books, religious articles, or any other wedding Judaica, Mekor is your reliable Judaica Specialist. We also carry a huge selection of Sephardic items: Benchers, Ketubot, etc. Get more for your wedding! 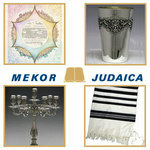 Don't forget to mention ChossonKallah.com when visiting Mekor Judaica.